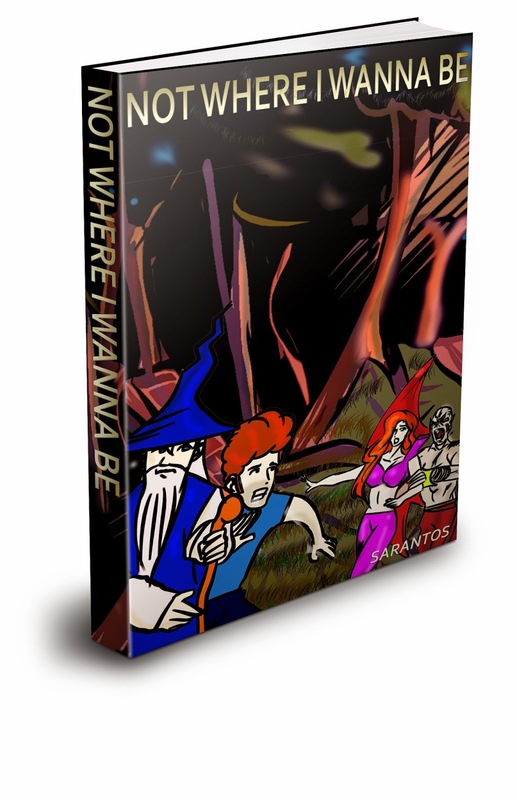 Today we are interviewing Sarantos, author of the novel Not Where I Wanna Be. Sarantos is a solo music artist who started a unique journey in 2014 releasing a song, music video & book chapter every month. He plans on doing this every month until the day he dies. Although he is a singer-songwriter, his true passion is lyrics so Sarantos decided to do something no other musician has ever done before! He wrote this 1st fiction/fantasy book mirroring each chapter after the specific song released that month. Sarantos has been writing lyrics since he was in the 4th grade and was always mesmerized by words. So Sarantos decided to do something no other musician has ever done before! He wrote his 1st fiction/fantasy book in 2014 but decided to raise the bar. The book is titled Not Where I Wanna Be which is the exact same title as his 1st CD. Additionally, Sarantos thought it'd be fun to mirror each chapter after the specific song released that month. This is the story of his fantastic journey. Who do you think would most appreciate your new book, Not Where I Wanna Be? I think the book would apply to a wide ranged demographic but probably more specifically 16 to 45-year-olds. Anyone who loves fiction and specifically stories about vampires will probably find it especially appealing. What was your favorite part about sharing your ideas in a book? My favorite part was being able to do more writing than I usually do in a song with my lyrics. I was able to express more intrigue and develop the character and scenes much more than I normally am able to. What inspired you to embark on this journey where you release a song, music video, and book chapter every month? My initial inspiration for finally doing something that I've wanted to do my entire life was the passing away of my father. This is what led me on this journey to finally start doing something that I'm so passionate about. Tell us a bit about the development of your interest in writing lyrics. All I can say is that words have always been very important to me, even as a child. I was always trying to write stories and songs for as long as I can remember. I think words are very powerful - much more so than anything else in the world. You’re a very creative person, having experience in literature, music, and music videos. Can you tell us about the similarities and differences in the creative processes for each of these forms of expression? The creative process I like to think is always basically the same. It all starts with an idea and what emotion you are ultimately trying to trigger. What story are you trying to tell in your song, music video or book? What is the theme? Are there double meanings? Obviously, each of these mediums is a very different as you can do a lot more in a book with words, in a song by including music and in a music video by including all 3 elements. The interaction of video, music and words is incredible and I wish I was not so limited in my budget to truly be able to bring to life what is in my head. What kind of music do you like to listen to when you’re not creating it? I listen to all sorts of music but probably my favorite genre is 80s music and then specifically rock and pop. Can you tell us a bit about any projects you’re currently working on? I’ve been offered an opportunity to tour around the world for 6 months but I had to pass that down because of my day job. I’m hopeful that I continue to grow and can make this creative process my full time job so I can continue to grow as an artist and continue this journey in a much bigger way all over the world.